From Oceans to Autumn return to Silber to face the five songs in five minutes EP challenge with their metal & shoegaze infused brand of post rock. From Oceans To Autumn are a band that has been featured before in this zine with a musical style I would describe as being doomgaze and this is a review of their 2013 ep "Pareto Analysis Volume 1" which was released by Siber Records. Drums range from slow to mid paced playing with no fast playing or blast beats being present on this recording, while the synths are very dark, atmospheric and ambient sounding, as for the bass playing it has a very strong and powerful sound with heavy riffing that dominates throughout the recording. Rhythm guitars range from slow to mid paced riffs t hat combine doom metal, ambient, experimental and shoegaze together to create a sound of their own with a good amount of melody being thrown into the riffing and there are no guitar solos or leads present on this recording. Vocals and songwriting are absent from this recording with the music being all instrumental, while the song themes cover darkness, as for the production it has a very strong and powerful sound where you can hear all of the musical instruments that are present on this recording. In my opinion this is another great sounding recording from From Oceans To Autumn and if you are a fan of this band, you should check out this ep. RECOMMENDED TRACKS INCLUDE "I" and "III". RECOMMENDED BUY. US quartet FROM OCEANS TO AUTUMN have been around since 2006, with a good number of albums and EPs to their name so far. The EP “Pareto Analysis Volume I” from 2012 was released on US label Silber Records as a part of an experimental series of EPs made under the condition 5 songs in 5 minutes. It becomes apparent that the five tracks that makes out this five minute long EP is a single composition, and it is just as apparent that the band have opted to shorten it to fit the premises of this production. The sound and scope is similar throughout, but while some sections represents ongoing developments on the songs others fade out with the next section fading in again. Still, the material itself makes this an interesting EP even if the material as such has been adjusted to fit the very precise premises for this EP. Tight, energetic bass and drums forms a compact, driving foundation for this composition, variation implemented by taking away one or the other at certain points as well as some pace alterations. Compact guitar riffs come and go as well, adding or subtracting impact, while resonating, melodic guitar details are represented by one or two layers. Again depending on the level of intensity at any given time. Hovering just about constantly on top of this are the textured, nervous light toned guitar motif that in subtle variations is the trademark sound of many bands exploring post rock or metal territories. 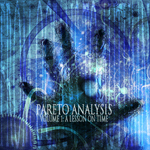 Pareto Analysis Volume I comes across as a well made effort in the borderlands between post rock and post metal, dark, tight and compact with a suitable amount of lighter toned, resonating and gentle details to keep matters interesting. The obvious doctoring of this composition a slight letdown, but interesting still to see how the band solved the challenge they had taken on here. From Oceans to Autumn is as Post-Rock as five minutes will allow. Typically Post-Rock needs time to build, time for crescendos. Here though From Oceans to Autumn works with this limitation. Each song works like a variation on a theme. Put together it is a whole full song. Repetition makes the songs seem that much longer. Giving off the illusion of songs longer than they actually are creates a strange sense of ‘time gained’. It helps that From Oceans to Autumn have a natural knack for understanding the importance of a melody, a single, memorable melody which is on display for all five of these pieces. ‘I’ introduces the album with the full assault of guitar, drums, and bass. The bass features prominently. For ‘II’ there’s a greater exploration of space. Everything sounds a little more stripped down with each instrument allowed to breath just a little bit more. ‘III’ is the closest From Oceans to Autumn has for a serious song. Slower tempos with a bit more in the way of build, it shows off what they can do with just a few additional seconds. Nuance is heard in the echoing guitar layers employed, adding an additional style. ‘IV’ explores the more skyward style, as the echoing guitars take up a larger percentage of time. By the finale ‘V’ the drums have completely fallen by the wayside. All that remains is just the guitars with a slight growl of bass. The result is a series of songs perfectly interlocking. Silber Records presents their artists with a rather unique challenge — their artists have to write a 5 song EP that totals 5 minutes as part of their aptly titled 5 in 5 series. The label enlisted the Charlotte, NC-based band, From Oceans to Autumn, a band that developed a reputation for epic, doom rock that’s drawn comparisons to Explosions in the Sky and the Octopus Project. Having such time constraints is an interesting thing and it allows for explosive bits of creativity. Check out the first track from From Oceans to Autumn’s Pareto Analysis Volume 1: A Lesson in Time. For a such a short period of time, the song rocks out and rocks out pretty hard.